Signature has announced the opening of nominations for its eighth Signature Annual Awards. 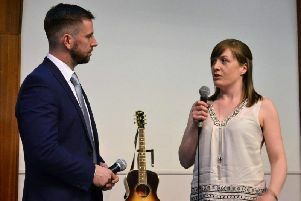 A leading provider of British Sign Language (BSL) and other deaf and deafblind qualifications in the UK has launched its search for the Aberdeen City and Shire’s most inspirational people involved in the deaf and deafblind community. Signature has announced the opening of nominations for its eighth Signature Annual Awards, which celebrates people across the UK who are involved in providing a positive impact on the lives of some of the 11 million deaf and hard of hearing people living in the country. Signature executive director Lindsay Foster said: "We are overwhelmed every year by the amazing stories that are uncovered through our awards and it gives us great pleasure in being able to celebrate the great work that is being done to help improve the lives of deaf people. “This year, the Signature Annual Awards will focus on ‘educators’, including new and experienced teachers of British Sign Language and teachers of the deaf, groups or individuals in the local community who create exciting learning opportunities for deaf and hearing impaired people, and business people who are improving customer service for deaf and deafblind people through staff training. Each year the Signature Annual Awards recognise people and organisations working with deaf people across the nation, and the search is now underway across Aberdeen City and Shire to find nominees who have made an outstanding contribution to the deaf and deafblind community. All nominees will receive a complimentary ticket to the awards, which will be held in January 2017 at Prospero House in London. The Signature Annual Awards ‘Signature Recognises... The Educators’, award categories include; Leadership in Education Award, Emerging Teacher Award, Enriching the Student Experience Award, The Community Champion Award, Educational Support Award, Transforming Lives through Education Award, Training Initiative Award and Signature Lifetime Achievement Award.